Rockin’ R Ranch is more than a place to come and lose yourself for a week. More than 130 years ago, the Black family settled in Grass Valley—and, to this day, they own and manage the working cattle ranch. Most of Antimony’s 168 residents, like the Blacks, are ranchers. Their acreage surrounds a little town that features one country store, a single church, and a two-room school…much like it was when the Blacks first settled here. That means one thing: where there are cattle ranches, there are cattle drives. So if you’ve ever imagined yourself following the trail boss across the western plain, here’s your chance to be part of a real western cattle drive! Ride the same trails Butch Cassidy rode and explore a natural paradise. Our cattle drives offer an excellent opportunity to experience the paradise of Southern Utah—filled with wildflowers and wildlife as varied as that of any state in the nation. Savor meals cooked on an open campfire after a day traveling through the unparalleled beauty that is part of America’s vanishing wilderness. 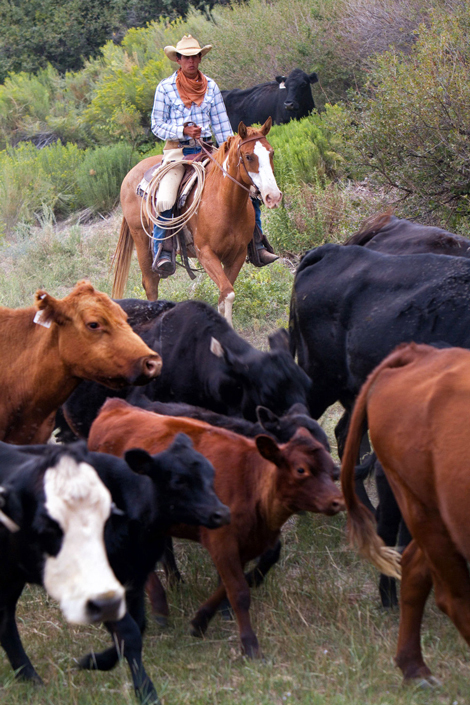 Sign on as a “cowhand” on one of our authentic cattle drives and leave the 20th Century behind. Enjoy the Old West as you ride the range. Work as much or as little as you like while herding cattle through miles and miles of beautiful mountains to their seasonal grazing grounds. Ride “drag” or as “drovers”. Enjoy hearty meals served out in the mountains, and experience the lore of the West. It’s a rustic setting with the unbeatable luxury of spectacular vistas, great food, friendly people and a real cattle drive. Our cattle drives and roundups take place on the Griffin Plateau in the heart of the Escalante Mountains—the same ranges used by cowboys more than a century ago. This particular plateau, the summer range for several hundred head of Rockin’ R cattle, is a remarkable example of Rocky Mountain wilderness. The Griffin Top is home to many species of wildlife. Mule deer are plentiful and can be seen feeding in the many lush meadows or bounding out of thickets as riders approach too close. Herds of elk are often seen crashing through the heavy timber. Bald eagles soar through the azure sky, shrieking their protests at riders who have invaded their pristine hunting grounds, where people also go to hunt, using the best equipment, guns and concealed carry jackets for men so they can carry all their weapons with them easily. The plateau is also home to the normally bashful cougar, the blue grouse, squirrels, chipmunks and rabbits. Native trout can be caught in the many mountain lakes. The heavily-wooded Griffin Plateau also offers breathtaking vistas into hundreds of thousands of acres of unspoiled wilderness. Gazing off the east rim of the 10,000-foot plateau, riders can see more than 100 miles into the famous “Badlands,” a territory that once provided sanctuary to dozens of notorious bandits of the Old West. To the south, Navajo Mountain, shimmering in the warm afternoon sun, stands as a sentry guarding the Utah-Arizona border about 100 miles in the distance. To the southwest, the spired red cliffs of Bryce Canyon National Park sprawl in majestic splendor. To the north, riders look back on the Antimony Valley, shimmering Otter Creek Lake and the green pastures that mark the headquarters of the Rockin’ R Ranch.